These Homemade Energy Bars with Dark Chocolate & Almonds are my savior during the work week – I like to grab one for breakfast, and I also keep a stash at work with me to curb those mid-day sugar cravings – Essential for when there’s a big batch of homemade cookies in the break room. The best part is that it just takes about 10 minutes of prep time on Sunday, and you’ll have enough bars to last you through the week! With the dark chocolate chips and almond butter, they’re a bit like biting into a Reese’s peanut butter cup, but they’re a deceptively healthy energy snack – Packed with superfoods like flax seed, coconut oil and goji berries. They’re rich in protein, fiber, Omega-3 fatty acids and Vitamin C – nutrients which we can all use more of in our daily diets. Another thing I love about this recipe is that it can be switched up to suit your personal preferences – or to just change things up from time to time. Try swapping out the almond butter for peanut butter or sunflower seed butter. Can’t get your hands on goji berries? Try adding in some dried cranberries or raisins instead. Don’t care for chocolate? Leave it out entirely, or add in some butterscotch chips or peanut butter chips. You can even add in cacao nibs for a healthier option. I’m going to be playing around with lots of variations – Top on my list? Swapping in this vanilla almond butter, chopped up dried apricots (instead of the goji berries), and white chocolate chips. 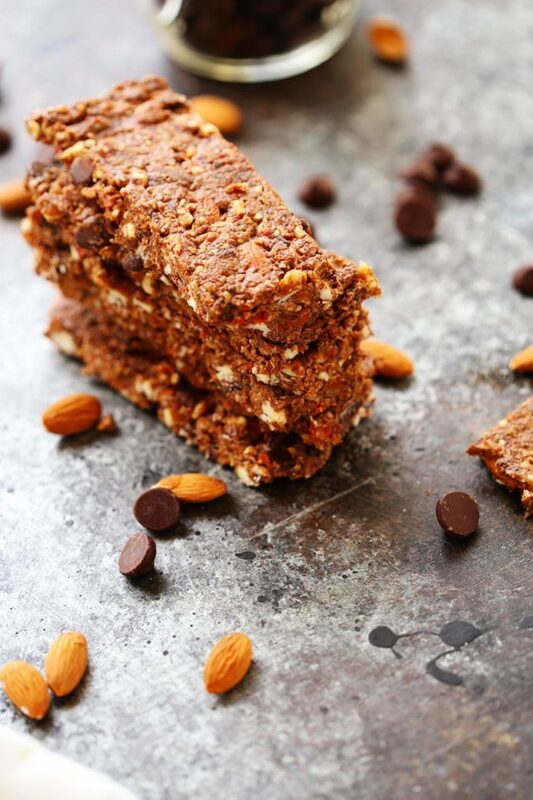 How would you customize these Homemade Energy Bars? These Homemade Energy Bars with Dark Chocolate & Almonds make a perfect grab-and-go breakfast or healthy snack. They're packed with protein and fiber to keep you energized throughout your day. Place the dates and coconut oil in your food processor or high powered blender (such as a Vitamix). Add the seed or nut butter. Process until well blended. Add to goji berries, coconut, flax, cinnamon and salt, and process until the mixture is well combined. Add the almonds and the chocolate chips and process until mixture is a dough-like consistency. You may need to add 2-3 tablespoons of water in order to form a mass. Scoop the mixture into a 8 x 8 inch pan, lined with parchment paper and press the mixture down firmly with the back of a spoon. Place in the fridge for at least one hour to harden. Cut into 1 x 4 inch bars and enjoy! Store these bars in the refrigerator for up to two weeks. If you allow the bars to come to room temperature, they will soften up too much and will be difficult to eat. 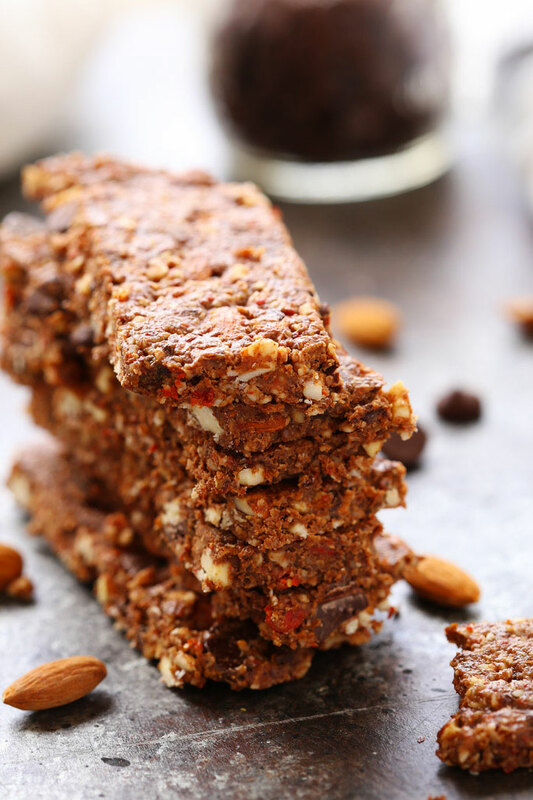 If you loved this Homemade Energy Bars recipe I would appreciate it so much if you would give this recipe a star review! Also, be sure to snap a picture of your finished bars and share it with me on Instagram using the hashtag #platingsandpairings and tagging me @platingsandpairings. Substitute raisins or dried cranberries for the goji berries – These bars are easy to adjust to your favorite ingredients. For an even healthier option, swap out the dark chocolate chips for cacao nibs. Looking for more healthy energy snacks? Try these Butterscotch Energy Bites too! Hi Erin – these look great! So much goodness you packed into this bar. Definitely want to try these – dark chocolate and almonds are the best! Arg! I ran out the door to my daughter’s pediatrician appointment without having breakfast and I was ravenous the whole time. I totally could have used one of these bars 🙂 I love anything with chocolate and almonds. Yum! I’m obsessed with Reeses – These make it easier to be guilt free! These look so good! Seems like they would make the perfect on-the-go snack! I’ve been experimenting with different energy bites and bars too. This one looks delicious!! Thanks Marlynn! I bet you need them after all those workouts you’ve been logging in – You’re my gym hero! What a great alternative to having cookies at work. I love all different types of energy bars and these look fabulous, if I were to customize them, I’d through in a bunch of chocolate chips. Hi Erin, thanks for the recipe! These look absolutely delicious! I’ve been scouring the internet for easy to do homemade energy bar recipes and these are just perfect! Will be munching on these all day! Thanks! Thanks Stephanie – I really think you’ll enjoy them! I need to make another batch this weekend!! !